Honda has revealed the first image of its prototype V6 turbocharged Formula One engine, set to mark the return of the manufacturer as sole supplier to McLaren. 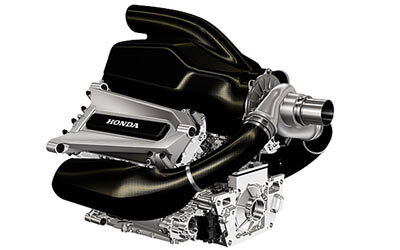 "Working toward Honda's F1 participation starting in the 2015 season, development of the power unit is entering its prime phase at our R&D facility in Sakura (Tochigi, Japan), where we transferred our automobile motor sports development earlier this year," said Yasuhisa Arai, the man in charge of Honda's Formula 1 project. "In addition to conducting simulations, we have moved onto the next stage where we conduct full-fledged bench tests of the engine while connecting the turbocharger and energy recovery systems. "In the meantime, our racing operation base in Milton Keynes, United Kingdom, has become fully operational. "At this time, we are unveiling an image of our power unit that is under development. "The whole team is concentrating on this development, getting ready for the forthcoming start of F1 participation in six months." McLaren meanwhile have put all their hopes on the new engine, aiming to lift their performance level following several years of fighting with Formula One's midfield teams.